*Hem-hem*… Threee, ohhh, threeee … It’s a magic number, yes, it iiiis….Well, it certainly seems Schoolhouse Rock was right on the mark this year; Shrek the Third, Pirates of the Caribbean 3, Spider- Man 3, The Bourne Ultimatum … 3-00 (?!) - Threes everywhere! 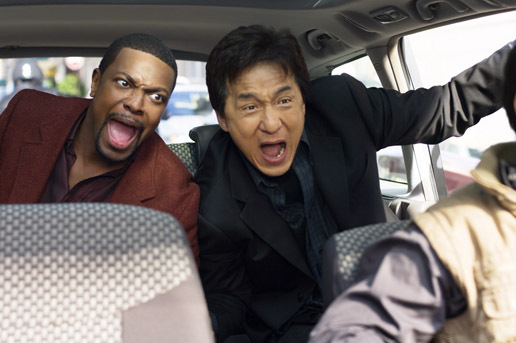 So, here’s another one for ya, the latest go-round for Jackie Chan and Chris Tucker in their cop/buddy film franchise, Rush Hour 3. The first film was deservedly a massive hit; the unlikely mix of the then-relatively unknown Chris Tucker, with his Minnie Mouse-pitched mile-a-minute delivery, paired up with God of Martial Arts Stunt Work, Jackie Chan truly clicked. 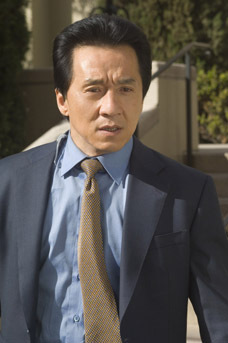 Now, I don’t know if you can tell from the previous sentence, but I am quite fond of Jackie, but sadly, somehow or other the charm and charisma (- not to mention kickass fighting skills), so evident in decades of Hong Kong action films, was badly lost in translation in his previous Stateside endeavours. The best representations of his work in the US were re-releases of his earlier Hong Kong films (- Rumble in the Bronx, par exemple). 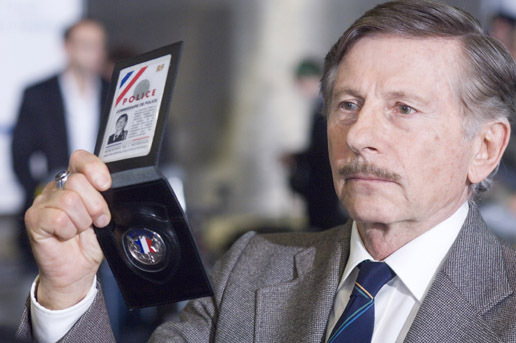 Still, Jackie had much to offer, but no US studio was clever enough to grab it up and sell it: Was it the edge of humour to all his films unable to fit in a Bay/Brucknerian world? Was it his tenuous and thickly-accented grasp of the English language? 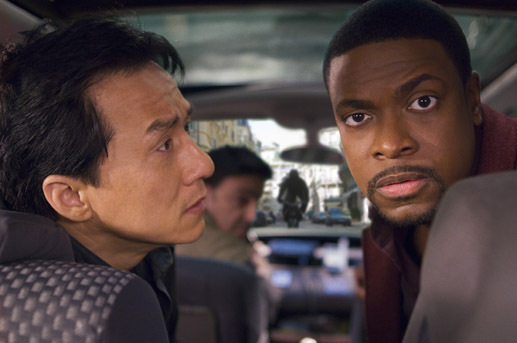 So, while I’m not hugely fond of Jackie playing second banana to anybody, the Rush Hour team-up seemed to make up for whatever Jackie was missing. 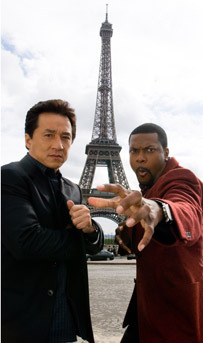 Chris Tucker brought the loudmouthed funny and Jackie brought the DIY wham, and through their chemistry, both actors were able to switch up and reverse roles convincingly, with Jackie able to display limited amounts of the charm and personality that made him the most famous star in China, and Chris Tucker not looking completely ridiculous playing action hero. The second film, ehh, not so much, despite moving the action to Hong Kong and Vegas. This one featured Zhang Ziyi, so stunning, but not on camera enough as a black-suited assassin. John Lone (The Last Emperor), who I’ve adored for decades, was the main villain, but it wasn’t enough to sustain the interest of either the audience or the actors. Still, it made boatloads and despite Jackie’s rather obvious disinterest in the proceedings and was expected to birth a third chapter. The good news is that the film has a lot of its fun back. Director Brett Ratner has spared no expense to set the table for some outstanding action. 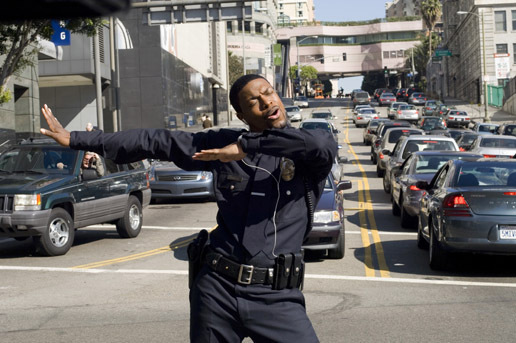 The premise (- if you care) has us back in L.A. where we find the once-Detective, now Officer Carter, directing traffic to the beat of Prince’s slow jam “Do Me, Baby”, replete with Carter’s classic Michael Jackson moves. 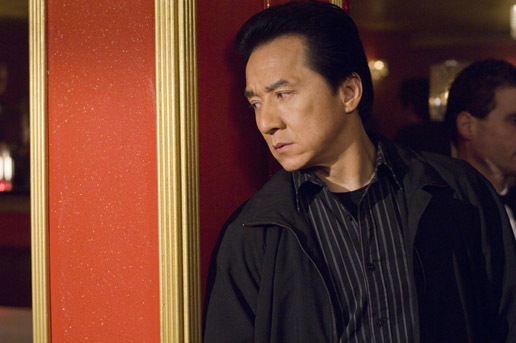 Chief Inspector Lee has resumed his life in China, and is bodyguard for Ambassador Han. The Ambassador has returned to LA to address the World Criminal Court to reveal a centuries-old secret that will expose the Chinese Triads, when a hit man edits his speech. Lee and Carter rejoin forces and hunt down the assassin, who seems to know Lee very well. The Triads mean business and go on to threaten the Ambassador’s teenage daughter, Soo Yung (- who was kidnapped in the first film – she should be used to this sort of thing by now. ), pitting Lee and Carter in a race against time to find the force behind the assassination that leads our heroes to the City of Lights. Oui, ça va! The best thing about this chapter is the visible change in attitude with Jackie. He seems to actually be enjoying himself. Though I never felt he gave less than 100% in any of his films, you could see the lack of spark in the previous sequel. Here, he gives himself over to the funny, belting out Roberta Flack/Donny Hathaway duets in a French cabaret, dancing in the streets of Paris, loose and more comfortable than he’s seemed in previous chapters. Though you can clearly catch a stuntman in some unfortunate moments, you can see Jackie really giving his action sequences all he has. 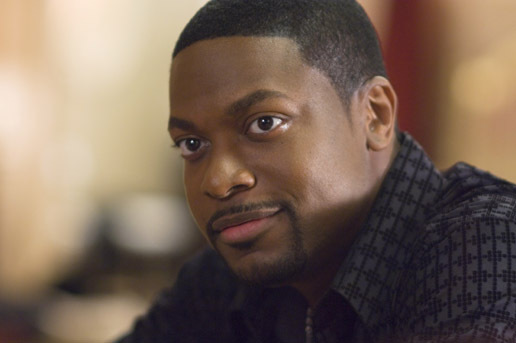 However… on the flip side of that coin we have Chris Tucker, who often sounds as if he’s reading his lines for the first time during the take and exhibits none of the freshness and snap that made him such a big find in the first film. Don’t get me wrong, he’s still a scream in many of the scenes (- the Chinese version of ‘Who’s on First?’ would have gone terribly wrong without Tucker’s timing), but you just get the feeling that unlike Jackie, he’s not giving his all. I found this distracting because I couldn’t imagine what other pressing engagements could’ve been occupying his thoughts as he hadn’t been in any other films since Rush Hour 2. The other complaint I have is one that’s plagued these films since day one. Why is it so difficult for American directors to properly film a martial arts fight? 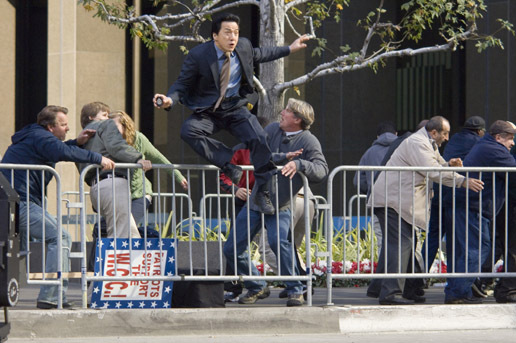 Leave it to Brett Ratner’s leaden way with a camera to make a Jackie Chan fight or stunt sequence seem run of the mill. Back that thing up, Brett. You don’t need to close in on Jackie’s work or use tons of quick cuts to add to the excitement, it’s already there. The effect his direction has on the action deadens it and despite Jackie’s best intentions, there are precious few WOW moments. My other problem was with those few impressive sequences that appeared rather obviously CGI generated. Even the incredible set up on the Eiffel Tower made me wonder how many technicians worked on the program for that scene. 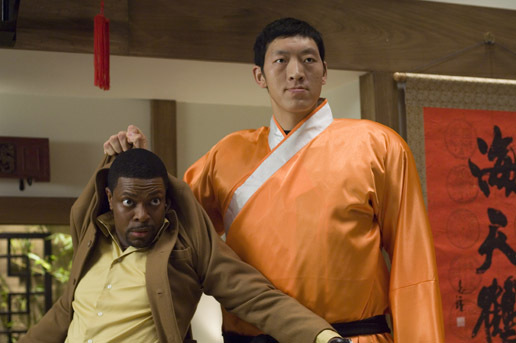 Rush Hour 3 sports a great supporting cast, including Father Merrin – er - Max Von Sydow, and a hands-on cameo by Roman Polanski. I was gratified to see the fabulous Youki Kudoh - the best thing in Memoirs of a Geisha –though I wasn’t as overjoyed to see her play a character so inadequately thought out that she’s only listed as “Dragon Lady”. “Dragon Lady” is practically orange, wearing a trowel’s worth of make-up and a severe, scraped back bun. 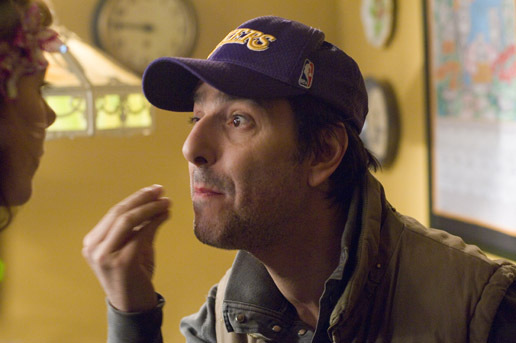 We have the representative from France, filmmaker Yvan Attal, as George, an American-hating cab driver, who is persuaded to embrace our violent ways after the trio is chased through the streets of Paris by Triad goons on motorbikes in one of those few standout action scenes I mentioned. My Yay moment was the inclusion of the brilliant Japanese actor, Hiroyuki Sanada, from Chen Kaige’s The Promise, who also wore the Best Hat Ever in The Last Samurai, and was robbed of an Oscar in Twilight Samurai. 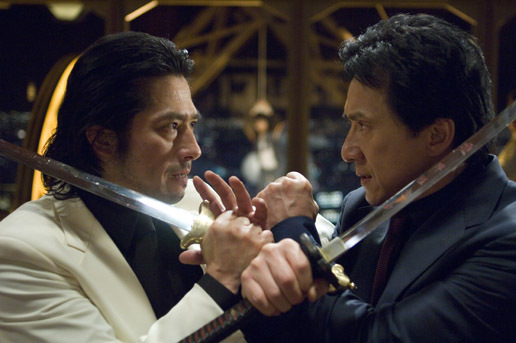 Sanada-san throws us some smooth Cantonese and swordplay as Kenji, a Triad assassin with a special tie to Inspector Lee. Sanada’s presence ups the intensity level in his fight scenes with Jackie. I only wish there were more of him. 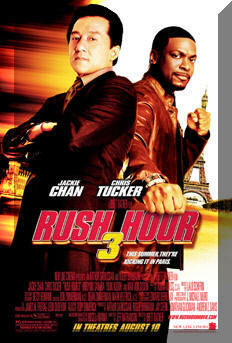 I would rate Rush Hour 3 above its predecessor and second-best in the trilogy. It’s a fun popcorn movie and when is seeing Jackie Chan doing his thing ever bad (- I don’t wanna hear anything about The Protector)? He and Tucker do still have a great chemistry and it’s really hard to screw that up. I wouldn’t go so far as to say this film begs for a Rush Hour 4 (- then again, neither did Rush Hour 2), but as a swan song to the series, which it should definitely be, it’s just fine – uninspired and hollow - but fine.